SMALL KUCING: Fair Weather! No Rain! Weather was bright. Roaring to go. Arrived, weather is still fair. No Rain. Wet wet water la . Time flies. Kejap aje the Cikgu(teacher) come and fetch me say time to go home. Mamarazzi is waiting for me. I was reluctant to go home. Wanna go school some more but Mamarazzi said if I am naughty, she won't bring me to school. It took me a few seconds to figure what wet wet water was.. Haha.. Good that things went well.. Yo.. Small Kucing.. Keep it up! It's sunny in S'pore too! Yipee! Hey, chk out NiNi Toy Bungee Review & International Giveaway!! to see if it's useful for your kid! Happy New Year to u and ur family! Steady ler Small Kucing. Hv fun in sch! He's very confident ! Good boy ! I hope you didn't rain too. I did rain.. buckets.. when mine went to kinder first day. Wa.... Go to school d... Long schooling journey ahead lo! Well done. Good way to start the New Year. I'm sure school will be fun for him. Kesian...the teachers. I hope they will not start leaving one by one. LOL!!! Fantastic to see your son with his bag and beginning the journey of education from now on. 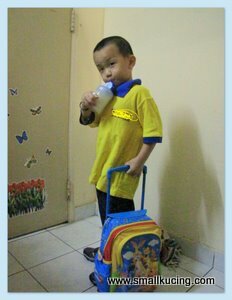 wow look great la the lil boy dah mula start school ya.. so cute..
good boy, mummy can fong sum! He certainly enjoys his school life!